This summer seems to be shaping up to be 'the season of the Cicada' as their presence is being heard more stridently this year than most other years - or at least here on the Coffs Coast. Australia has a huge reputation for cicadas with a predicted 700-1000 species. This figure far outstrips South Africa and North America's 150 and 170 respectively. The United Kingdom can only lay claim in a single species. However having said that though, there are only around 350 Australian Cicada species that have been scientifically described. These critters start their life as a nymph living underground in the soil and feed off the sap from roots. To date, there is no hard and fast rule on just how long Cicadas spend underground but there is anecdotal evidence that suggests it to be somewhere between 6-10 years (depending on species), crikey! 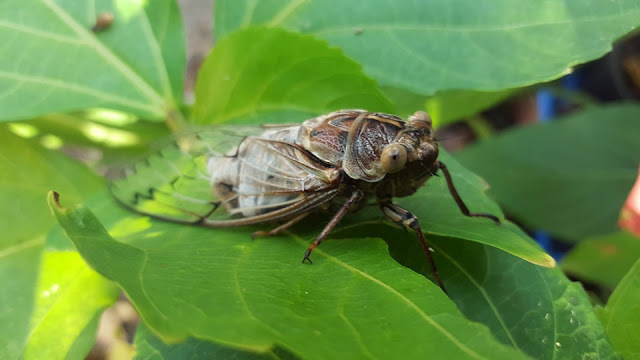 Cicadas belong to the one large family, the Cicadidae and are classified in the order Hemiptera, which includes all insects with piercing and sucking mouth-parts - some examples of other Hemiptera are aphids and scale insects. A rainfall event prior to their emergence seems to be important (perhaps the ground is softer for them to make their way out of the ground?). They feed on the sap of soft-wood branches using their piercing, sucking mouth-parts. It has been found from extensive survey research that different vegetation communities support different Cicada communities. How long do Cicadas live for? Cicadas typically only live for one to four weeks and their sole purpose is to find a mate. 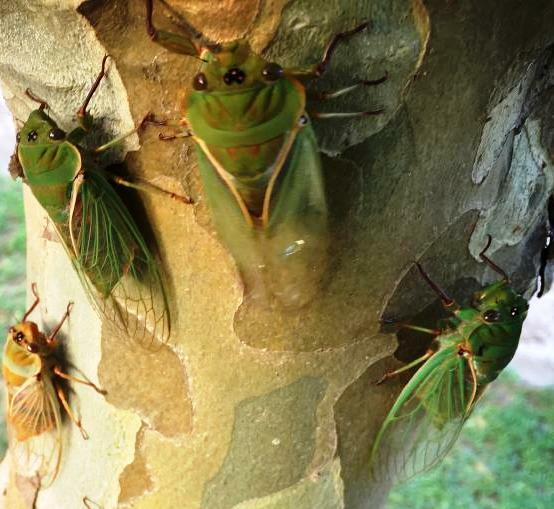 After mating, female Cicadas deposit several hundred eggs into slits made in grass stems or in the bark of a tree or shrub. A few weeks later, flea-like young (nymphs) hatch and drop to the ground, they then tunnel into the soil. When the mature nymphs emerge from the soil they shed their skins (that delicate brown remnant seen on tree trunks etc) and get down to the serious business of reproducing. It is only the male Cicada that sing as part of their mating call to females. There are different 'songs' for different species to only attract females of their own species. Australian Museum has an excellent article which goes into far more detail about Cicadas as does ABC Science. For information on some rather interestingly named species Australian Geographic is the link to see about Bladder, Floury Baker, Cherrynose, Northern Double Drummer, Greengrocer, Tasmanian Hairy (a rather scary looking Cicada) and Redeye species.